Let’s remember 1991! 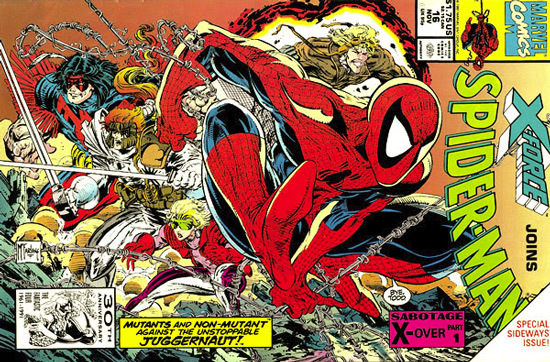 I just finished reading Spider-Man: Masques, which collects a bunch of issues from the adjective-less Spider-Man book from the Todd McFarlane era. And by judging the art and story in this collection, he’s already got his mind set in the direction he would take with Spawn. That said, Masques features two stories set in darker, supernatural world. The first one has Spider-Man facing off against Hobgoblin, who is now a demon on a mission from God to rid the world of sinners. The plot gets a little wonky at this point, as Hobgoblin has abducted the son of a woman he murdered. Little Adam believes Hobgoblin is an angel of some sort. Taking a child is enough to get Spider-Man’s attention. Hobgoblin is killing innocent people, which always get his dander. It’s 1991. Ghost Rider’s popularity is at its peak and he has to make as many cameo appearances as inhumanly possible. Our heroes wind up chasing Hobgoblin all over New York, with the biggest problem being that Ghost Rider is more concerned with killing Hobgoblin than ensuring the boy’s safety. The story ends kind of abruptly with Spider-Man stopping Ghost Rider, who intends on beating the villain to death. The story ends with Spidey giving a lecture on justice not necessarily meaning vengeance, Ghost Rider blowing him off and McFarlane getting to draw two issues worth of chains all over the place. The second act is Spider-Man donning the old’ black Venom style suit, as he literally goes underground to investigate people disappearing all over Manhattan. It turns out the homeless people living in the subway have been feeding “sinners” to on-again, off-again hero/villain vampire Morbius to quench his bloodthirsty. Unfortunately, Spidey has to inform him that he’s been fed people who aren’t criminals. Morbius is pretty upset about this revelation; he goes nuts attacking the homeless people and then runs of on his own, presumably to start his new solo series. Again, this is from the early 1990s, so it’s the second height of Marvel’s super natural hero popularity. These stories really look like they could have been out of Spawn. The backgrounds, the panel layout, even the homeless people who resembled the Vindicator all show up. The ties between Spider-Man and Spawn aesthetically speaking are really strong. The final story is a crossover with X-Force. You can’t get much more 1990s comic art then this, with both McFarlane and Rob Liefeld teaming up. This comic just might be the birth of “widescreen” comic books, as the art is laid out on the page lengthwise. This is pretty much what you would expect; its sheer visual mayhem. What you might not expect is the story; longtime mutant terrorists Juggernaut and Black Tom team up some mercenaries in an attack leading to the destruction of the upper half of one of the World Trade Center’s towers. It’s very uncomfortable reading this story in a post 9/11 world, as the background imagery is eerily similar to the actual. I hadn’t read this since college, and completely forgot about this. Spider-Man: Masques is a nostalgia book, for anyone who grew up reading comics during the 1990s. It sums up everything in comics at that point on the Marvel end: superstar artists, X-Men characters, supernatural plot lines, everything. It might not hold up that well, but it’s a great look back at that era. 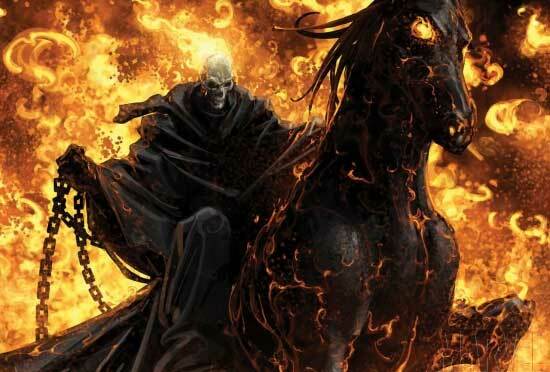 Crank masterminds Mark Neveldine and Brian Taylor had their chance to reboot the Ghost Rider franchise with Ghost Rider: Spirit of Vengeance. To no surprise, the film was in the style of Crank, and it was a fun mess. Anyway, Blaze encounters wino/biker/monk Moreau (Idris Elba) who offers to remove the Ghost Rider curse in exchange for protecting a child who just happens to be the son of the Devil. Apparently the evil lord of the underworld wants to transfer himself into the boy’s body and thus becoming the Anti-Christ, bringing on the apocalypse. Things get weird along the way, as there is a Blaze/son of the devil/his hot mom Nadya relationship, kind of like the Arnold Terminator/Connors relationship in Terminator 2: Judgement Day. To make things worse, they’re all being chased by the Devil worshiper’s army of mercenaries and Nadya’s ex-boyfriend, who has been turned into the supernatural decaying super villain Blackout. And you thought you were having a bad day. The movie is shot across Romania and Turkey, and visually its awesome. It looks really remote in foreign. The special effects were awesome. Idris Elba was amazing, and the rest of the cast was decent. But the film could have been better. I liked what Neveldine and Taylor were doing stylistically, with all the weird cut scenes. But what they really needed to do was go completely insane full tilt. Maybe it was a decision so they could keep the film PG-13, but I would have loved the film to be a little more absurd. Maybe they cut some scenes out of it. Who knows. It would be interesting to see the director’s cut. Since Ghost Rider passes judgement on people, let me pass a final judgement on this film. I would give it a solid B. The concept made sense, but there were a few parts that could be tightened and tweaked. It’s a fun super hero film that doesn’t take itself seriously. Who like the Wu-Tang Clan? The Shaolin based rap crew loves dropping references to geek culture just us much as they create dark gritty imagery. Did you know that Method Man is a huge Ghost Rider fan? Meth takes a few of his nicknames from the character, ranging from flat-out calling himself the Ghost Rider, or borrowing his secret identity of Johnny Blaze, in most of his songs. He’s even named a few of his mix tapes (underground non-label releases) The Ghost Rider Volume 1 and 2 and Johnny Blaze Strikes. He takes his Ghost Rider love to a whole new level in the video for the Wu-Tang song “Triumph”, where during his verse he’s driving around New York City on a flaming motorcycle! When Wu-tang came out, I was in high school and I always thought it was awesome that Meth was a comics fan. It just showed that people who liked comics are awesome. Have you ever wondered who would win during a Ghost Rider/Galactus fight? The Fantastic Four episode “Planet Eater” addresses that problem. Our fiery headed biker joins forces with the Fantastic Four to stop the devourer of worlds. The only difference is that he isn’t that concerned with saving the earth as much as vengeance. As we remember, Ghost Rider is a spirit of vengeance, a sort of demonic agent of penance. He rides around making those who have taken a life pay for their crimes. So someone like Galactus would be a big target for him. Think about it this way; our planet has over four billion people living on it. If Galactus ate the earth, that’s the equivalent of killing that many people at once. Galactus has been around forever, so that death toll is pretty high. I won’t spoil the episode for you, but let’s say that Ghost Rider’s “penance stare” (him channelling and projecting the pain and suffering of victims) is pretty good Galactus repellant. Because this is from the mid 1990s, he does the penance stare and his jacket, it is safe to say that this is the Dan Ketch incarnation of Ghost Rider. 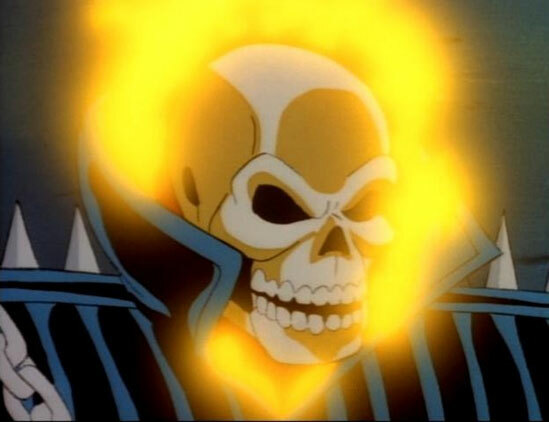 In this episode, Ghost Rider is voiced by Richard Grieco from 21 Jump Street. You know, the first Ghost Rider film really wasn’t that bad. I recently re-watched Nick Cage’s debut as the Spirit of Vengeance. I won’t say that this was a classic, but I was certainly entertained by it. Here are five things I really enjoyed about this film. Peter Fonda’s Mephisto was taken in a completely different direction than the Marvel comics version. By not making him a big red devil, Fonda made the lord of the underworld a lot more creepy and a subtle character. In line with that, I liked how the rest of the supernatural characters were more human than monster in appearance. The visual effects were awesome. Sam Elliott’s Carter Slade (the original Ghost Rider) was a great addition to the story, as it gave Blaze a mentor, something that is at times lacking in the comics. Cage enjoyed this…a lot. It’s a pretty well-known fact how much the actor loves comic books, and this was his first comic book movie. He lobbied long and hard to get the title role, battling Johnny Depp for the spot. This translated very well for all the publicity he did for the film. You could tell that he was legitimately excited about the movie in all of his promotional appearances. I know that is part of the job, but you could tell he genuine about it. As we all know from his work on the Preacher series, Garth Ennis can certainly write supernatural fiction set in the late 1800s. His Ghost Rider: Trail Of Tears is exactly that, telling the tale of the Ghost Rider of the post-Civil War era. This story is about former Confederate lieutenant Travis Parham trying to put his past behind him. Things only get worse after he finds out that his friend, a former slave named Caleb, and his family were viciously murdered. As he seeks to avenge their deaths, a certain Spirit of Vengeance gets involved and I can assume you know how this is going to turn out. Art on this book was done by digital painter Clayton Crain, who uses a dark moody pallet to bring the story to life. Its haunting and brutal, which totally suits this. Anyway, as the new Ghost Rider movie approaches, I will be posting more Ghost Rider related things. Definitely read this in the mean time. 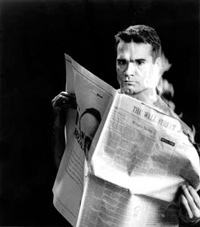 I first heard “Ghost Rider” at some point between the end of high school/early college and just thought it was awesome that Henry Rollins was singing a song about Ghost Rider. It turns out that “Ghost Rider” wasn’t an original Rollins Band song. They were borrowing it from early industrial/synth band Suicide. The proto punk rockers Suicide! A few years ago I was introduced to the band, which loosely took its name from the title of a Ghost Rider story called “Satan’s Suicide.” The minimalist duo was one of the first–if not the first–acts to call themselves punk rock, and Suicide has been named as an influence to a wide variety of bands and musicians, including Bruce Springsteen, Radiohead and Primal Scream. Rollins was clearly influenced them, just watch the two videos to see how much of his stage mannerisms (including the way he holds the microphone was borrowed from Suicide front man Alan Vega. You can hear a whole slew of covers of “Ghost Rider” by musicians of all different genres, and M.I.A. even samples the riff in her song “Born Free”. For those of us without an iPhone or Android powered cell phone, it can be depressing that you can’t do all those cool Instagram photos. Well to those of us who are kicking it old school, there’s Pixl-O-Matic. This website based service allows you to make some really awesome vintage style pictures. 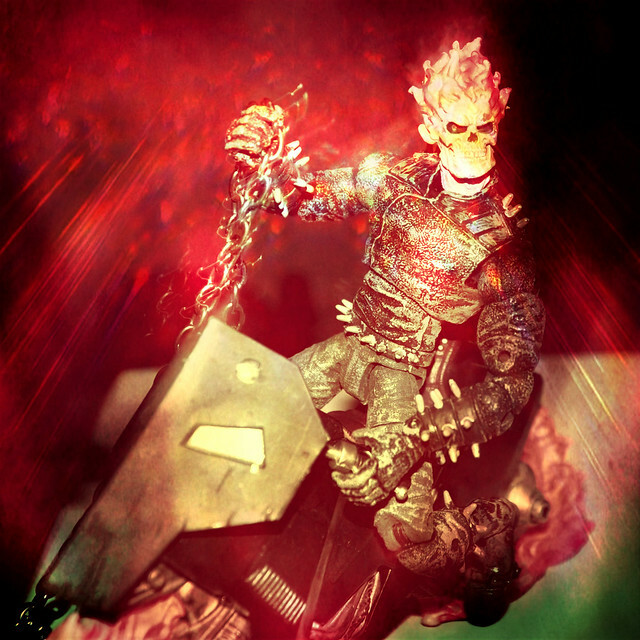 The Ghost Rider picture above was done through a process of using Pixlr-O-Matic filters and then running the resulting image through Photoshop, repeating the process over and over again to get the colors washed out. My goal was to focus all the crazy lighting effects from his chain, since this was a figure of the Dan Ketch version of the hero, whose weapon was a mystical chain. The end result was this, and I’m pretty content with the final project. So let me know what you think. 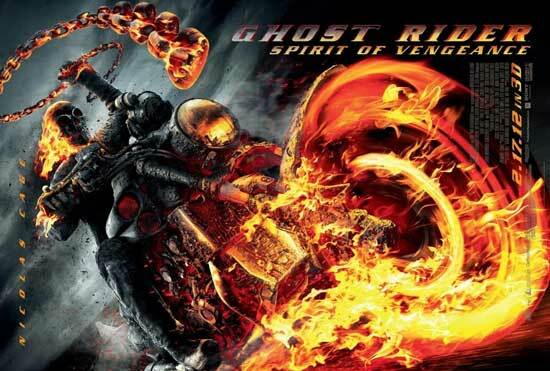 In the meantime, we’re getting closer to Nick Cage reprising the role of the Spirit of Vengeance, in the appropriately titled Ghost Rider: Spirit of Vengeance, which hits the big screens on February 17, 2012.